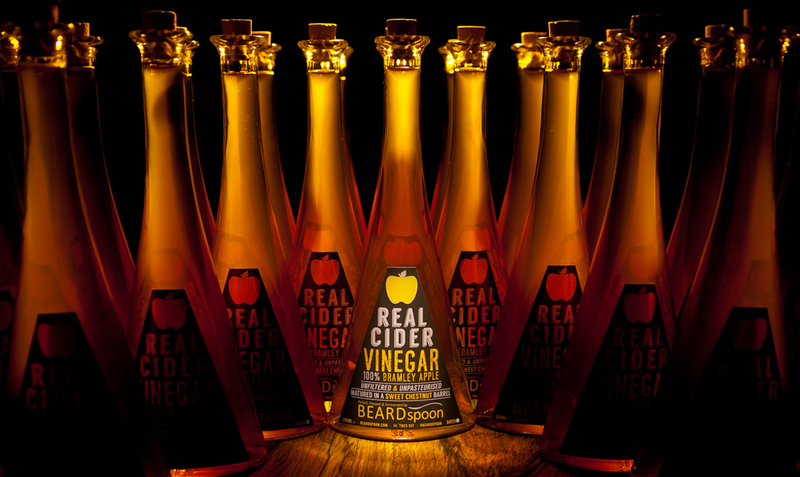 Our Real Cider Vinegar is made from 100% pure Apple Juice which is allowed to fully ferment before maturing in our Sweet Chestnut Barrel for minimum of 12 months where the second fermentation takes place. During this fermentation process, the alcohol is converted into vinegar by acetic acid-forming bacteria (acetobacter). Acetic acid and malic acid give vinegar its sour taste. We then bottle the vinegar direct from the barrel unpasteurised and unfiltered. This means you may find some of the gelatinous material called the ‘mother' or sediment in the bottle, this is perfectly normal. Our first batch of Bramley Cider vinegar was a great success and sold out very quickly, not only does it taste great but also looks the part in our stylish cork stoppered bottles. Cider Vinegar can be used in many different things in the kitchen such as salad dressings, marinades, vinaigrette's, food preservatives, and chutneys. It has also been hailed for its health benefits, consuming 1 -2 teaspoons day has been said to help with health issues from Diabetes to heart disease. It has also been reported that it can help with skin PH, whiten teeth, sooth sunburn, aid weightless, balance the body's natural systems and reduce heartburn. Our 2019 Vinegar is available now!